Now Includes: How To Beat Insomnia with Hypnosis audio and a complimentary PDF chapter of Benjamin’s 2013 best-selling Book How To Change Your Life. Are you unhappy at the moment? Struggling to see the light through the trees? Is being unhappy affecting your life? How To Increase Happiness with Hypnosis is part of Benjamin’s latest hypnotic collection, whereby he uses the latest in hypnotic techniques to increase happiness through visualisation, internal reflection, and superficial projection. If you need to increase happiness within your life then take advantage of this fantastic hypnotic recording today. Benjamin Bonetti’s Designer Lifestyle Range has been specifically developed for those looking to build a successful, confident, and highly motivated lifestyle. Each product within the 10-part series offer a number of suitable solutions to social issues, pressures, and concerns. Within these linguistically encrypted audios Bonetti utilises the power of hypnosis to open up and remove restricted beliefs, empower thoughts and massively increase your ability to achieve the lifestyle you want. 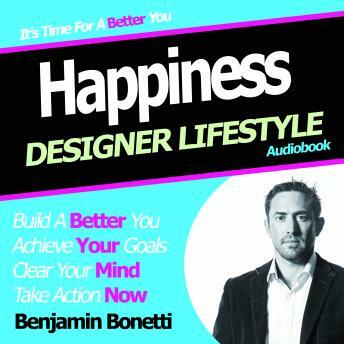 About Benjamin: Using the three pillars of success, Benjamin Bonetti, best-selling self-help author and hypnotherapist, helps people, through fitness, well-being and nutrition, become a better version of themselves. Benjamin’s no-nonsense and practical advice has been regarded as refreshing and inspiring within the arena of self-development. He utilises hypnosis and Neuro-linguistic Programming to change thinking patterns and inspires others to take massive action, through a number of tools designed to change the mind-set. In 2012 Benjamin became the leading BBC self-help audiobooks author with a new advanced range of hypnosis audios reaching the top-ten charts within just a few weeks after release. The Easy Way range includes the titles; Weight Loss, Original Gastric Band, Confidence, Self Esteem and 7 other titles. In 2013, Wiley’s Publishers released the first of two of Benjamin’s published books - How to Change Your Life, which was WH-Smiths twenty-third best-selling no-fiction book over the Christmas and New Year period. His second book How to Stress Less (August 2014 release) is predicted to achieve similar success. Ex-military - Benjamin has appeared in a number of magazines, radio and TV features as the “Celebrity Secret Weapon”, including; The Sun, BBC Radio, Metro Magazine, The Irish Times, Friday Magazine, Bookish, HR Grapevine, Diets in Shape, Slim At Home, Decision Business Magazine, The Gulf News, The Best You, Celebrity Wife Swap, Latest 7 Magazine, and is the "preferred" A-list coach for international celebrities. As a philanthropist he also sponsors a team of models and athletes, demonstrating what an individual can achieve - not only in their fitness, but also in their well-being and health…by following his own advice. How can I expect others to do as I say if I fail to follow my own advice?